› Author AffiliationsThis work was supported by the JST-ACCEL program (JPMJAC401). We are also grateful for funding from the JSPS KAKENHI [Grant-in-Aid for Challenging Exploratory Research (No. 26620090) and for Scientific Research (C) (No. 16K05876)]. Supporting information for this article is available online at https://doi.org/10.1055/s-0037-1611769. 11 PS–PEG-Supported Diphenylphosphine 3Ph2P (1) (469 mg, 2.5 mmol) was added to degassed anhyd THF (20 mL) under N2, and the solution was cooled to –78 °C. A 1.6 M solution of n-BuLi in hexane (1.6 mL, 2.5 mmol) was added dropwise, and the mixture was stirred for 1 h at –78 °C. The resulting mixture was added to a suspension of bromo-functionalized PS–PEG resin 2 (TentaGel S Br purchased from Rapp Polymere; average diameter 0.90 μm; Br content: 0.32 mmol/g; 3.1 g, 1.0 mmol) in THF (30 mL) at –78 °C. The resulting mixture was warmed to rt and shaken for 3 h. The solvent was removed by filtration and the solid was washed sequentially with H2O (3 × 5 mL) and CH2Cl2 (3 × 5 mL) under an inert atmosphere, then dried under vacuum to give the PS–PEG-supported diphenylphosphine ligand 3.31P SR-MAS NMR (162 MHz, CDCl3): δ = –14.4. 12 PS–PEG-Supported Palladium–Diphenylphosphine Complex 4The PS–PEG-supported diphenylphosphine ligand 3 (2.0 g) was treated with allylpalladium(II) chloride dimer (117 mg, 0.32 mmol) in THF (20 mL) at rt for 2 h under N2. The resulting polymeric material was collected by filtration, washed with THF (3 × 5 mL), and dried under vacuum to afford pale-yellow polymer beads.31P SR-MAS NMR (162 MHz, CDCl3): δ = 14.8. ICP analysis showed the presence of 0.168 mmol/g of Pd. 13 Flow Hydroxycarbonylation of Iodobenzene (5a); Typical ProcedureA 25 mM solution of iodobenzene (5a) and K2CO3 (2 equiv) in H2O/CH3CN (2:1) was pumped at a flow rate of 1.0 mL/min (contact time: 58 s) through a Phoenix flow reactor system equipped with two cartridges of 4 (total 500 mg; 0.084 mmol Pd). 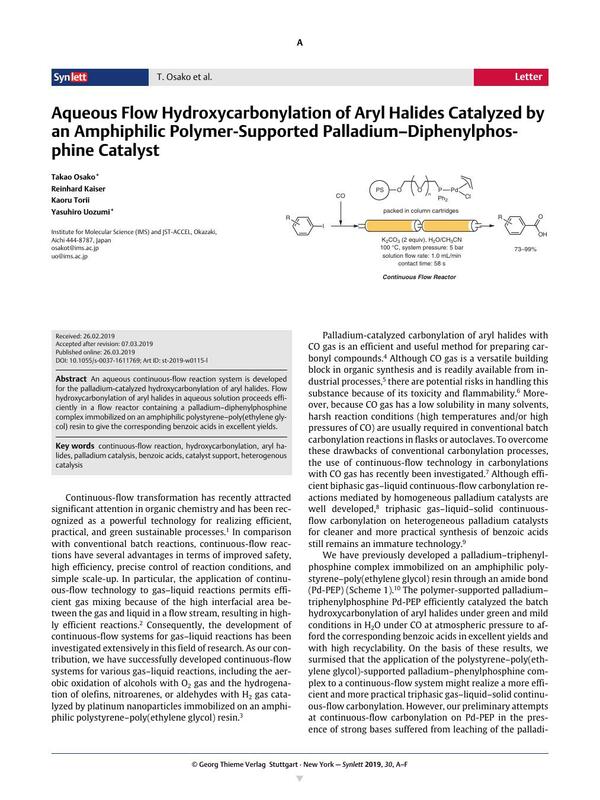 Flow hydroxycarbonylation with CO gas introduced from a gas module (10 mL/min) was conducted at 100 °C and a system pressure of 5 bar. The resulting solution was collected for 50 min (50 mL) and the solvent was removed by evaporation. 2 N aq HCl (10 mL) was added and the resulting solid was collected by filtration, washed with H2O (3 × 10 mL), and dried under vacuum to give benzoic acid (9a) as a white solid without any further purification.Yield: 125 mg (82%); mp 122 °C; 1H NMR (400 MHz, DMSO-d 6): δ = 12.96 (br s, 1 H, COOH), 7.93 (d, J = 7.2 Hz, 2 H, PhH-2 and PhH-6), 7.62 (t, J = 7.2 Hz, 1 H, PhH-4), 7.49 (t, J = 7.2 Hz, 2 H, PhH-3 and PhH-5); 13C NMR (101 MHz, DMSO-d 6): δ = 167.32 (COOH), 132.87 (Ph), 130.76 (Ph), 129.26 (Ph), 128.57 (Ph); ESI-TOF-MS (neg. ): m/z = 121 [M – H]–.